I remember how nervous, frustrated and clueless I was with my first born. Here I was calling my mom every time my daughter wouldn’t stop crying. Everything was new to me and hearing my baby cry and being fussy non stop was horrible to me. I even called her doctor once or twice! The truth is that your newborn’s cry can make you go insane because you just don’t know why your baby is crying. After baby is fed, dirty diapers are changed and it seemed like you have done everything to calm her down, she’s still crying! I’m sharing with you today the easy ways you can soothe your fussy baby when nothing seems to work! Because I know what you’re going through and I know what can work! When you become a mom, you sort of learn as you go and that’s exactly what happened to me. With my first born, I learned what made her fussy and what things I had to do in order to help her feel better. My mom and aunts helped me a ton, for which I am so grateful for. Believe me hearing your baby cry for the first time is so magical and amazing. But, once baby is home, reality sets in and you’re super tired and overwhelmed, the last thing you want to hear is your baby cry for long periods of time, specially when you can’t seem to comfort her. These tips will help you figure out why your baby is fussy and what to do to comfort your baby. 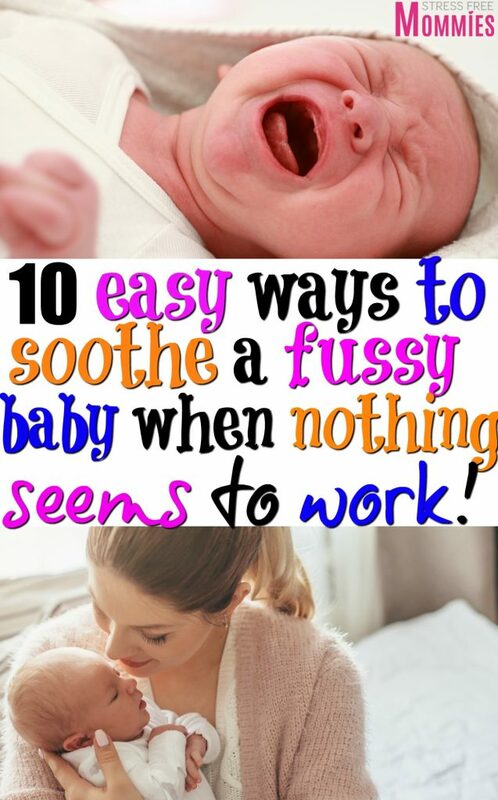 I hope you find these 10 easy ways to soothe your fussy baby helpful and useful. Disclosure: This post contains affiliated links for your convenience. You can read my disclosure here. Make sure to use an anti-colic baby bottle like these ones! I wrote a post all about helping your baby with colic, where you can read right here. Having a diaper rash is no fun for babies. My second daughter had the worst diaper rash I had ever seen when she was a baby, it broke my heart and of course she was extremely fussy. So please make sure to check if your baby has a diaper rash and simply treat it! I used and loved the A+D diaper rash ointment to help treat her rash. And, I also changed the diaper brand that I was using to the brand Pampers, which made all of the difference. Sometimes your baby may be allergic to whatever chemical a brand of diaper may have, so switching to a different one can really save you your sanity and your baby pain. Car rides for the win! This has always worked for all three of my children. Whenever I have tried everything to soothe my fussy baby, taking a ride in my car or going on walks with my babies has done the trick. The car or stroller movement can soothe your fussy baby. You can also try putting your baby in a baby swing for the soothing back and forth movement. Your baby may just want to be held by you or your partner. You can simply rock your baby back and forth to sleep and also make “shushing” sound softly in your baby’s ear. I would always shush my baby’s to sleep or to calm them down when they were fussy, they loved it. Is your baby having a hard time falling asleep but it’s clearly easy to see how sleepy she is? Well mama, welcome to the club of stubborn babies who refuse to sleep or take naps even though they are practically falling asleep! 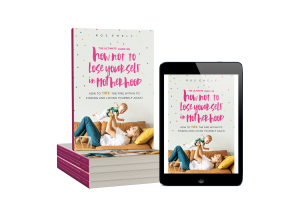 Here’s an e-book that I recommend checking out , How to Get Your Baby to Sleep without Being Held! Mom life gets so much easier once baby can fall asleep on his own without being held. Your fussy baby might just be sleepy and does not know how to fall asleep and therefor fights his sleep. If your baby only falls asleep when your holding him, it can be hard for you and everyone else in your household. You won’t be able to do anything around the house, you feel drained and you honestly can’t live like this. This e-book will show you simple strategies on how you can help your baby fall sleep anywhere else but your arms! Maybe a change in environment can soothe your fussy baby. Take time to get out of the house and smell the fresh air. Take a long walk with your baby and see how she feels. Also, how about going into a different room of the house, a more quieter area can make all of the difference. Sometime babies may get irritated by noise or a super bright room. Help your fussy baby by creating a calm and comfortable environment. Have you ever thought that maybe your baby’s clothes is making him feel uncomfortable? Yes! Maybe your baby’s clothes are too tight or making him feel hot. 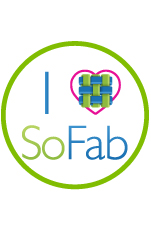 Help soothe your fussy baby by putting on breathable and light clothing. Your baby might indeed be hungry and that’s why he may be fussy. If you find that your baby drinks all of his formula and then gets irritated or fussy right after. It can be that he was still hungry. 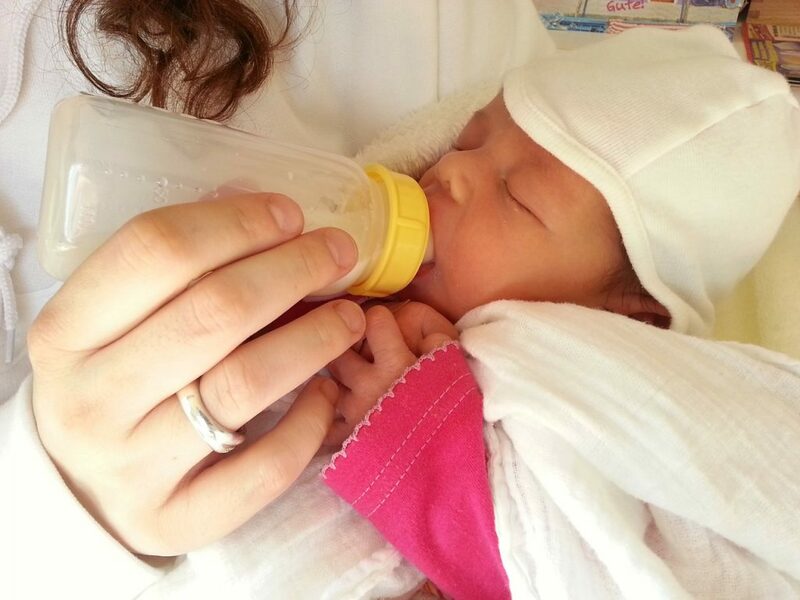 Try increasing the ounces of formula milk or breast milk you give your baby by 1 ounce and go from there. A hungry baby is definitely a fussy baby. If you are breastfeeding your baby, make sure your baby is getting enough milk and that you have enough supply. Again, you do not want your baby to stay hungry because he will get fussy. Sometimes all baby wants is to hear your voice, so speak to him! Talk to your baby, sing a lullaby and connect with your baby 🙂 Also, cuddling works as well, your baby wants to feel secure and what better way than in his mother’s or daddy’s arms. As you saw you can totally soothe your fussy baby, you just need to apply a few techniques and see what works for your baby. I know it can be totally frustrating hearing your baby cry and not knowing what’s wrong. Even if you think you have tried everything to calm your fussy baby, just remember these tips and see if it works for you! Sometimes your baby may be fussy because she’s hungry, needs a diaper change or sleep, you know the obvious. But there are times that your baby may be fussy because she’s in pain and that’s the only way she can express to you, by crying. Maybe she has colic, is constipated or has a diaper rash! 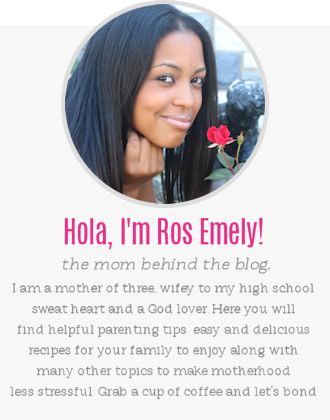 I hope you found these tips useful and let’s all say good bye to fussy babies! These tips are totally going to help your baby feel better and be less fussy. Hooray for that mama! Recuerdo lo nerviosa, frustrada y despistada que estaba con mi primera hija. Llamaba a mi mamá cada vez que mi hija no paraba de llorar. Todo era nuevo para mí y escuchar a mi bebé llorar y ser exigente sin parar fue horrible para mí. ¡Incluso llamé a su médico una o dos veces! La verdad es que el llanto de su recién nacido puede volverlo loco porque simplemente no sabea por qué llora tu bebé. Después de alimentar al bebé, cambiar los pañales sucios y parece que ha hecho todo lo posible para calmarla, ¡todavía llora! ¡Estas 10 maneras fáciles de calmar a tu bebé quisquilloso cuando nada parece funcionar te ayudarán a lograrlo! ¡Ayudar a tu bebé a calmarse, dejer de ser quisquilloso y de que esté contento! Cuando te conviertes en mamá, aprendes poco a poco y eso es exactamente lo que me sucedió. Con mi primogénito, aprendí lo que la inquietaba y qué cosas tenía que hacer para ayudarla a sentirse mejor. Mi mamá y mis tías me ayudaron muchísimo, por lo que estoy muy agradecida. Créanme que escuchar a su bebé llorar por primera vez es tan mágico e increíble. Pero, una vez que el bebé está en casa, la realidad se establece y usted está súper cansada y abrumada, lo último que quieres escuchar es a tu bebé llorar durante largos períodos de tiempo, especialmente cuando parece que no puede consolarla. 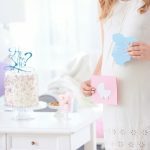 Estos consejos te ayudarán a descubrir por qué tu bebé está inquieto y qué hacer para consolar a tu bebé. Espero que estas 10 formas fáciles de calmar a tu bebé quisquilloso te sean útiles. Divulgación: esta publicación contiene enlaces afiliados para su conveniencia. Puedes leer más sobre esto aquí. ¡Asegúrese de usar un biberón anticólico como estos! Escribí una publicación sobre cómo ayudar a tu bebé con cólico, donde puedes leer aquí. Tener una dermatitis del pañal no es divertido para los bebés. Mi segunda hija tuvo la peor erupción de pañal que había visto cuando era bebé, me rompió el corazón y, por supuesto, ella estaba extremadamente quisquillosa. ¡Por favor asegúrese de verificar si su bebé tiene una erupción de pañal! Utilicé y me encantó el ungüento A + D para tratar el sarpullido. Y, también cambié la marca de pañales que estaba usando para Pampers, lo que hizo toda la diferencia. A veces, su bebé puede ser alérgico a cualquier químico que pueda tener una marca de pañal, por lo que cambiar a uno diferente realmente puede salvarle la cordura y el dolor de su bebé. ¡El carro para la victoria! Esto siempre ha funcionado para mis tres hijos. Cada vez que he intentado todo para calmar a mi bebé inquieto, dar un paseo en mi carro o salir a caminar con mis bebés ha hecho el truco. El movimiento del coche o del cochecito puede calmar a su bebé quisquilloso. También puede tratar de poner a su bebé en un columpio para el bebé para el relajante movimiento hacia adelante y hacia atrás. Es posible que su bebé solo quiera que lo sostenga usted o su pareja. Simplemente puede mover a tu bebé hacia adelante y hacia atrás para dormir y también hacer que el sonido de “shushing” suene suavemente en el oído de su bebé. Siempre le hacia el “shush” a mi bebé para que se durmiera o para calmarlos cuando estaban inquietos, les encantaba. ¿Le resulta difícil conciliar el sueño a su bebé pero es claramente fácil ver lo cansada que está? ¡Bien mamá, bienvenida al club de bebés tercos que se niegan a dormir a pesar de que prácticamente se están quedando dormidos! ¡Aquí hay un impresionante libro electrónico (es en ingles) sobre cómo ayudar a su bebé a dormirse sin que lo sostengan! Nina from sleepingshouldbeeasy le guiará y ayudará en la importancia de establecer una rutina, cómo programar las horas de despertar de su bebé para que su bebé pueda dormirse sin problemas, qué ayudantes del sueño lo ayudarán a dormir en cualquier lugar ¡y mucho más! Sé lo frustrante que puede ser tener un bebé quisquilloso, ¡porque he estado allí 3 veces! Si parece que no puede dormir a su bebé durante largos periodos de tiempo, no tiene tiempo para buscar respuestas en la web y desea establecer una rutina de sueño efectiva, ¡entonces necesita este e-book! ¡Guarde su cordura, haga más cosas en la casa y siéntase menos estresada porque su bebé finalmente está durmiendo! Tal vez un cambio en el medio ambiente puede calmar a su bebé quisquilloso. Tómese el tiempo para salir de la casa y oler el aire fresco. Haga una caminata larga con su bebé y vea cómo se siente. Además, ir a una habitación diferente de la casa, un área más tranquila puede marcar la diferencia. En algún momento los bebés pueden irritarse con el ruido o una habitación súper brillante. Ayuda a tu bebé quisquilloso creando un ambiente calmado y confortable. ¿Alguna vez has pensado que tal vez la ropa de tu bebé lo hace sentir incómodo? ¡Sí! Tal vez la ropa de su bebé este demasiado apretada o le haga sentir calor. Ayude a calmar a su bebé irritable poniéndole ropa ligera y transpirable. Es posible que tu bebé tenga hambre y es por eso que puede estar quisquilloso. Si descubre que su bebé bebe toda su fórmula y luego se pone irritado o irritable inmediatamente después. Puede ser que todavía tenga hambre. Intente aumentar las onzas de leche de fórmula o la leche materna que le da a su bebé por 1 onza e ir desde allí. Un bebé hambriento es definitivamente un bebé quisquilloso. 9. Bajo suministro de leche? Si está amamantando a su bebé, asegúrese de que su bebé esté recibiendo suficiente leche y de que tenga suficiente suministro. De nuevo, no quiere que su bebé tenga hambre porque se pondrá inquieto. A veces todo lo que el bebé quiere es escuchar tu voz, ¡así que habla con él! Hable con su bebé, cante una canción de cuna y conéctese con su bebé 🙂 Además, abrazos también funciona, su bebé quiere sentirse seguro y qué mejor que en los brazos de su mama o papá. Como viste, puedes calmar totalmente a tu bebé inquieto, solo debes aplicar algunas técnicas y ver qué funciona para tu bebé. Sé que puede ser totalmente frustrante escuchar a tu bebé llorar y no saber lo que está mal. Incluso si piensa que ha intentado todo para calmar a su bebé inquieto, recuerde estos consejos y vea si le funcionan. A veces, su bebé puede ser quisquilloso porque tiene hambre, necesita un cambio de pañal o dormir, usted sabe lo obvio. Pero hay ocasiones en que su bebé puede estar inquieto porque siente dolor y esa es la única forma en que puede expresarse llorando. ¡Tal vez tenga cólico, esté constipada o tenga una erupción de pañal! Espero que hayas encontrado útiles estos consejos y que todos nos despidamos de los bebés quisquillosos. Estos consejos ayudarán a su bebé a sentirse mejor y ser menos quisquilloso. ¡Hurra por eso mamá! These are awesome tips! Having a newborn or even an older baby who cries can be so stressful and exhausting! These tips are ones I used myself!